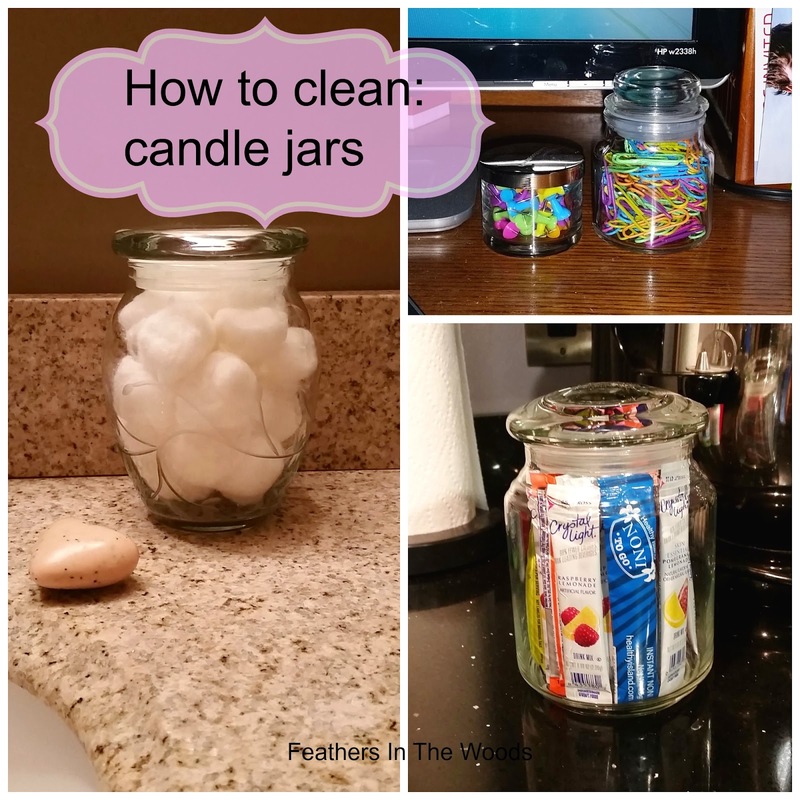 If you're anything like me you have a bunch of almost empty candle jars sitting around just waiting till you get the time to clean and re-use them. Oh yes, I have big plans to reuse these lidded jars to store and organize all kinds of things! They will look so nice lined up with my dried herbs in them. Or on the bathroom sink. Or used as a vase with a pretty bow around them. I just never have the time to do it. Well, the time is now! The method is simple....and we're gonna do it today! So gather up all your used scented candle jars and pop them in the freezer and lets get started. First, you're going to wait about an hour for the candle remnants to freeze. Once frozen just stab the wax inside with a butter knife and it should break into a few chunks. Just shake them out of the jar into a bowl. You can throw them away, use them in wax melt holders, or even reuse them to make fire starters. Next, let the glass come back to room temperature and heat some water on the stove. You'll want it hot but not quite boiling. 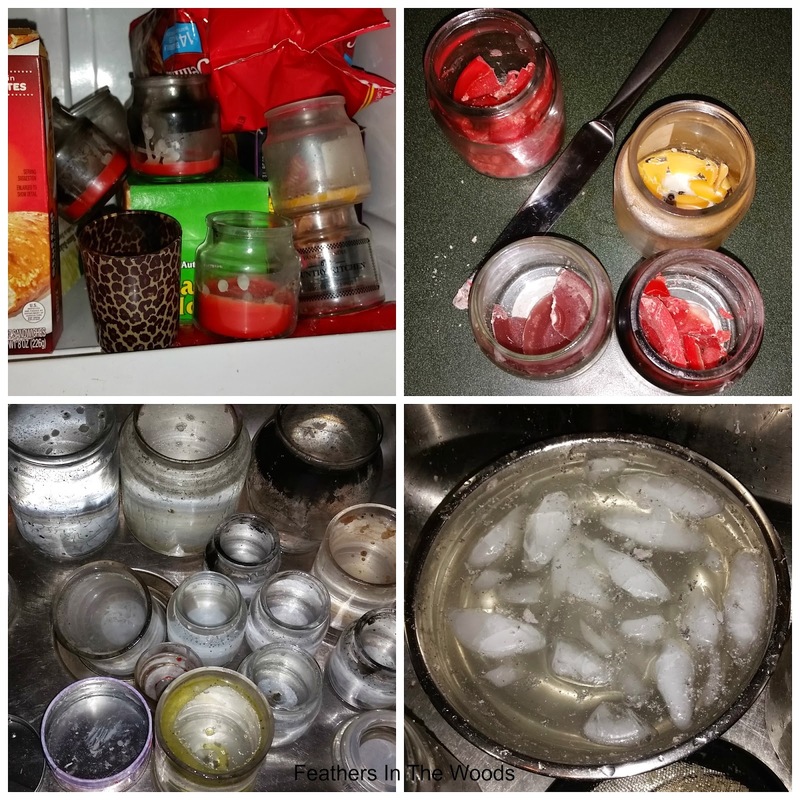 (boiling water can cause the glass to shatter) Place the jars in your sink and pour the water into the jars till full. Now you just wait for the wax to melt. While waiting on the wax, get a bowl and dump some ice cubes in it. Once the wax is melted, slowly pour the water into the bowl. You may need to use a pot holder or oven mitt to hold the hot jar. The wax should solidify and float to the surface in little pieces. Strain it out and throw the wax away so it doesn't clog your drain. Your jars should be mostly clean now. A squirt of dish soap on a scrubbing sponge and some warm water should remove any streaky marks or soot on the jars. If they have labels now is the time to remove them. They should peel off easily since they're wet. If there is residue left behind just apply a little bit of cooking oil, let it set a few minutes and wipe off with a paper towel. (you could use Goo Gone or WD 40, but I prefer plain 'ole cooking oil) You might have to wash again with dish soap to remove the oil. Let dry and use them for whatever you want! That was easy, wasn't it? Now why in the world did I wait so long? Great idea for reusing the pretty candle jars. I just love to repurpose items. I have a lot of used scented candle jars with me, I will get started with this! Green cleaning improves air quality and is safer than traditional cleaning. The improvement is so drastic, in fact, that many companies have noticed a reduction in sick time, and related healthcare costs. I agree completely! We use way too many chemicals...especially when growing food! A friend of mine told me the freezer part but I never seemed to be able to get ride of the left over streaky bits. Thanks for sharing this will give it a try.